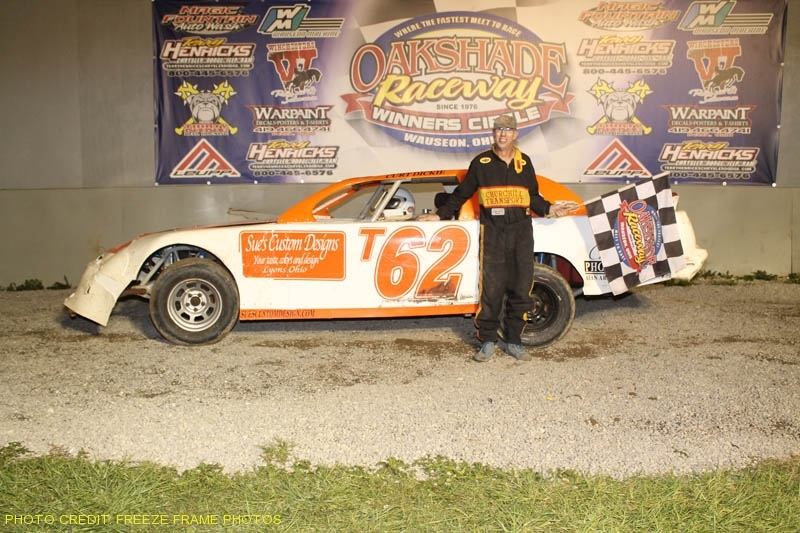 Bruce Stuart and Tim Line were both winners in the annual Sportsman Twin 25’s at Oakshade Raceway on Saturday night. Stuart was the winner of the first 25-lap UMP Sportsman feature event with Line capturing the checkered flag in the second. Tim Fisher grabbed the early lead of the first UMP Sportsman feature until last week’s feature winner, Bruce Stuart, passed him on the outside on lap four. Stuart proceeded to pull away and maintained his advantaged while working through lapped traffic on his way to an easy victory in a caution-free Sportsman feature number one. Mike Jessen got by Fisher to finish second. Joe Derbeck and Tim Line finished fourth and fifth respectively. For the second UMP Sportsman feature, Stuart drew an eight out of a possible six, eight or ten inversion. With the eight car inversion, Matt Lindsey took the early lead after starting on the outside of the front row. Tim Line quickly closed in and began to pressure Lindsey for the lead. After a caution on lap six, Line was able to get by Lindsey for the top spot. Stuart climbed back up to second by lap seven but could not mount a serious challenge for the lead. Stuart began to fade near the end of the race after slipping back to third by lap 20 after Jessen made the pass. Jessen, however, was unable to get by Line who earned his third feature win of the year. Jessen had to settle for second again with Matt Lindsey ending up third. A tire change after the first race didn’t work out for Stuart who could only manage a fourth place finish. Bob Gregory’s fifth place finish was enough to maintain a slim seven point advantage over Jessen in the Sportsman point standings. Brian Ruhlman got around pole-sitter Curtis Deisenroth for the lead on lap six of the UMP Late Model feature. Ruhlman opened up a big lead once he got by Deisenroth, but Casey Noonan would begin to reel him in late in the caution-free race. Noonan, Deisenroth, Dona Marcoullier and Ryan Missler had a heated battle for second through fourth early in the race. Once Noonan disposed of that competition, he began to work through lapped traffic to make up ground on Ruhlman. Noonan caught Ruhlman near the finish, but couldn’t get close enough to make a bid for the lead while they were still in heavy traffic. After winning the UMP Modified feature a couple weeks earlier, Ruhlman picked up his first UMP Late Model feature win of the year. Noonan finished a close second followed by Missler, Marcoullier, and Deisenroth. UMP Bomber action produced the most exciting finish of the night and new leader in the point standings. Jeff Foks had a slight point advantage over Terry Rushlow at the beginning of the night. Foks was involved in a hard crash during his heat event which forced him into a borrowed car to start at the tail of the UMP Bomber B Main. This produced a great opportunity for Rushlow to gain the point lead. Rushlow was a major factor in the UMP Bomber A Main, but it was Perry Cox who led the first three laps of the race. Jeff Geis took command after a restart on lap four with Rushlow following him into second. Geis and Rushlow had a good battle for the lead most of the race, but things got ugly on the last lap. Rushlow got to the inside of Geis in the final set of corners and the two drivers got together in turn four. Both drivers crashed down to the inside of turn four as the rest of the field raced back to the checkered flag. The beneficiary of that incident was Amy Bernard who started 13th. She went from third in turn four, to first on the front stretch to win her first UMP Bomber A Main. Dave “Gumby” Golembiewski Jr. came home second and Curt Lancaster was third. Roscoe Stetten was the hard charger of the race after starting 23rd and finishing fourth. Justin Gamber finished fifth. Rushlow fell back to finish 14th, but it was good enough to take a 10 point lead over Jeff Foks. William Cundick started near the tail of the Oakshade Hornet feature race and had the lead by the completion of lap one. Drew Smith and Maverick Wright were just behind Cundick, but they began racing each other side by side which allowed Cundick to pull away and pick up his first win of the year. Wright was able to get by Smith to finish in second. Josh Froelich finished fourth and last week’s feature winner, Cody Laney, ended up fifth. “Sparky Marky” Gillingham moved over to the UMP Sport Compact division after running the first half of the season with the Hornets and picked up the feature win in his very first attempt. He led from flag to flag and snapped a four race win streak by Trent Delong. Delong was challenging Gillingham for the lead when the two drivers made contact. Delong fell off the pace and finished his night in the pits. Derek Morris had an exciting race with Jeff Wells for second and finally got by him near the finish to end up in the runner up position. Regan Ford finished fourth with Jeff Girdham in fifth. Mike Plotts was leading lap one of the UMP Bomber B Main when he got too low in turns three and four and ended up running into the tires on the inside of the corners. That incident took Plotts out of competition. Garry Domoe inherited the lead after that and held it until Richard Riffe took it away on lap four. Riffe came to a stop while under a yellow flag on lap nine for a spin by Terry Rump. That turned the lead over to Jim Remley from Toledo, Ohio. Remley went on to pick up the victory over Chris Sands, Jeff Foks, Garry Domoe and Scott Robertson. Oakshade Raceway will host the American Late Model Series (ALMS) this coming Saturday, August 4, paying $2,000 to the ALMS feature winner. The Cans From Race Fans food drive will also be going on with lots of prizes to be awarded to some fans bringing in canned food donations. The UMP Sportsman, UMP Bomber, Hornets and UMP Sport Compact classes will also be in action. Gates open at 4pm with racing at 7pm.